July 3, 2017, 7:56 a.m.
Süddeutsche Zeitung’s text marketing editor selects which stories will be only available to subscribers and tries to format those pieces to attract new subscribers. By Joseph Lichterman @ylichterman July 3, 2017, 7:56 a.m.
Every day as the clock ticks toward the German newspaper Süddeutsche Zeitung’s 5 p.m. print deadline, Jenny Buchholz sits at her desk in the heart of the paper’s Munich newsroom and reads through the stories that will be posted online that evening and in the next day’s print paper. 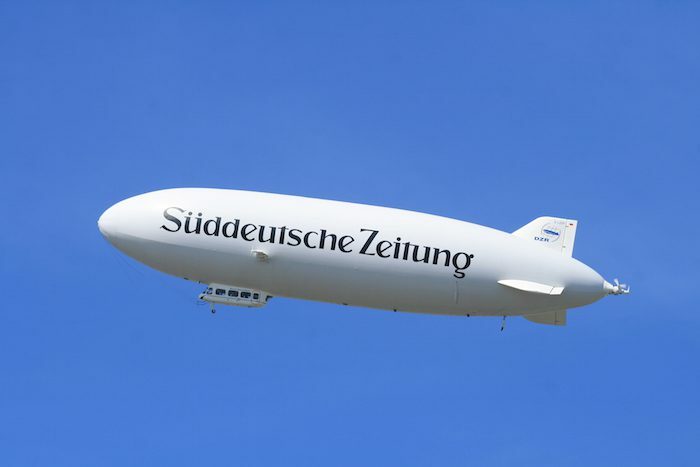 Buchholz is SZ’s text marketing editor. Her mandate is to decide which stories will only be available to the paper’s premium subscribers, and which might appeal to potential subscribers if they’re packaged in a way that will convince people that they’re worth paying for. She works with Andrea Landinger, who helps refine the coverage to improve SEO and clickthrough rates. 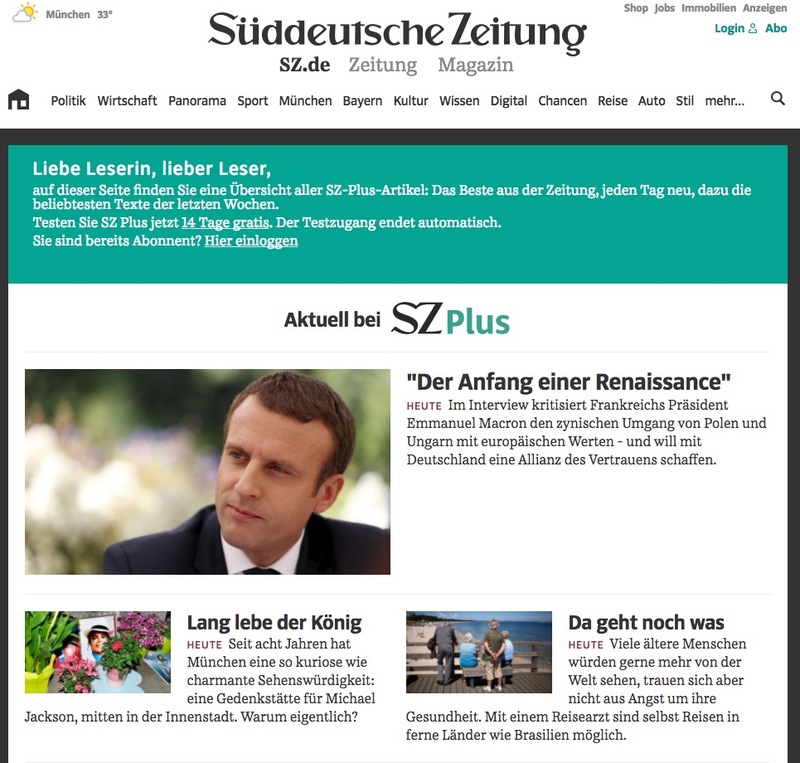 SZ created the text marketing role to coincide with the launch of its digital subscription model, which it calls SZ Plus, in 2015. The paper’s paywall strategy is somewhat complex. General interest stories from wire services are freely accessible on SZ’s site. A meter allows free access to 10 staff-written stories per week. Premium stories and digital editions of the paper, however, are only available to paying subscribers. A full-access digital subscription costs €34.99 (about USD $40) per month. Readers can also purchase €1.99 day passes that give them access to the stories behind the paywall. A two-week trial is free. 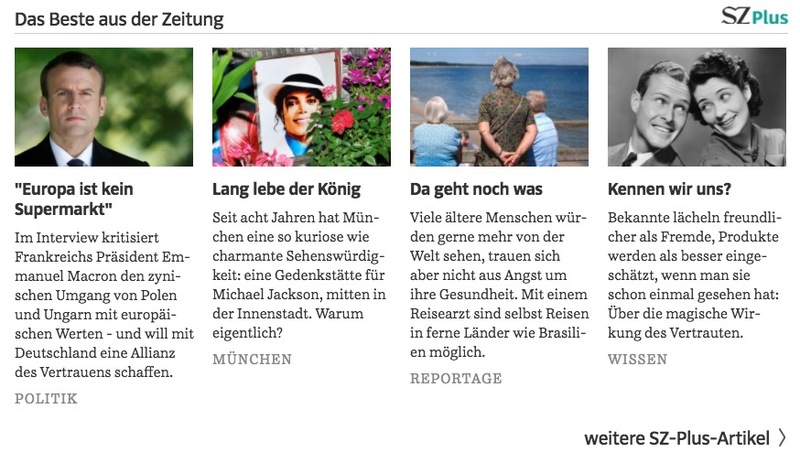 The “best of the newspaper” section on the SZ homepage features four stories that are only accessible via SZ Plus. The stories Buchholz chooses for those slots are generally from that day’s paper, and go live at 7 p.m., coinciding with the release of SZ’s digital edition. A separate SZ Plus page collects all the premium stories. The site features older stories that were popular and also lets readers search for stories or sort them by topic. Buchholz looks to highlight longer stories that will be worth readers’ time nd that cover a variety of topics. She then writes a headline and chooses an image that will help the story stand out on the busy homepage. “I need this one article to be convincing and worth their while,” she said. From the beginning, SZ viewed the text marketing role as one that needed to be in the newsroom. Buchholz sits near the paper’s top editors and regularly consults with them about what the newsroom has planned. At WAN-IFRA’s Digital Media Europe conference in Copenhagen in April, SZ digital editor Stefan Plöchinger told me SZ purposefully structured the text marketing position in the newsroom so that it would fit into the newsroom’s workflows. Buchholz works with staffers to write short teaser versions of SZ Plus stories that she also posts on the homepage to entice readers to buy access to the full version. The job has a marketing aspect to it, as its name implies. Buchholz works closely with staffers on the business side of the organization, said Johannes Hauner, SZ’s head of digital marketing. The budget for promoting stories on social platforms such as Facebook or via email campaigns comes from the marketing department, and working with the editorial team, Hauner said they’ll determine the best way to utilize that budget and which audiences they want to target. SZ, for instance, will target stories to users with specific interests and also resurface timely archival content. Buchholz also chooses up to 15 evergreen premium stories that are shown on rotation to un-logged-in readers when they try to read an SZ Plus story. SZ Plus had 55,247 subscribers in the first quarter of 2017, and while he provide specifics on conversion rates or how many daily passes the paper sells, Hauner said the paper looks at metrics both from outside platforms and its own website to analyze how it can improve how its pitches to would-be subscribers. On Facebook, for instance, it wants to be able to target as many interested users as possible, without breaking the bank. “The cheaper it is in the target group you want to reach, the better,” he said. But on its own site, SZ looks at how readers navigate its conversion funnel and interact with the paywall. The most important metric, Hauner said, is the number of subscribers, but another key data point the paper follows is how many people actually click on the subscription offers. As part of this process, SZ regularly conducts A/B tests. For instance, it tested out different formats for the best-of section that highlights SZ Plus stories. It ultimately decided just to feature four stories a day, but Buchholz picks up to seven different stories to test out in that area, ultimately winnowing them down to four. SZ ultimately sees the text marketing position as a way to reach readers and help maintain a sustainable digital business. Photo by Felix Ro used under a Creative Commons license. POSTED July 3, 2017, 7:56 a.m.
Lichterman, Joseph. "This paper has a text marketing editor (who compares the job to picking people up at a bar)." Nieman Journalism Lab. Nieman Foundation for Journalism at Harvard, 3 Jul. 2017. Web. 20 Apr. 2019. Lichterman, Joseph. "This paper has a text marketing editor (who compares the job to picking people up at a bar)." Nieman Journalism Lab. Last modified July 3, 2017. Accessed April 20, 2019. https://www.niemanlab.org/2017/07/this-paper-has-a-text-marketing-editor-who-compares-the-job-to-picking-people-up-at-a-bar/.